Nature attempts to outstrip ISEA2013 with a brilliant, painterly light show as delegates and guests are ferried up the mangrove-lined narrows of the Parramatta River. Save for a strip of blue on the horizon, where the sun burnishes low hanging clouds, the sky is amorphously grey. Suddenly there are cries and approving murmurs, cameras shuttering, iPhones flashing, passengers coursing onto deck to see a vast double rainbow arching high behind the ferry, intensely vibrant where it reaches earthwards. As the rainbow fades and we once again face the windward chill, the sun impressionistically dusts soft waves of faint cloud with rich and oranges and reds against the grey. 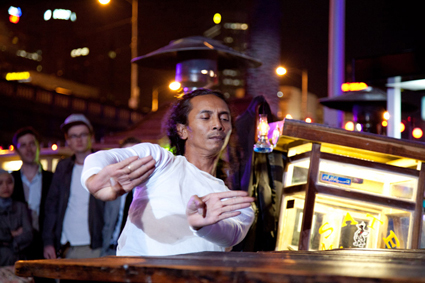 Will Electric Nights—an ISEA2013 riverside evening event in Parramatta—withstand the challenge? It does, on its own terms. As we walk from the ferry in the early dark, tall shafts of blue and pink light dress buildings, creating a sense of a large, contained, festive space between two bridges. Beneath one of them is Josh Wodak’s Archangle Assemblages, in which five riders perch on bicycles, pedalling in synch to generate enough power to harmoniously trigger a pattern on the grid of bulbs that hangs before them. The work “generate[s] audiovisual rhythms and reference[s] the bioluminescence of fireflies as they synchronise their flashing” (program note). Harmony doesn’t always come easy, even for a cooperative species such as ours, so sweat is expended and competitiveness kept in check as the riders pedal to achieve unanimity at speed. A mass of large white balloons hangs beneath the bridge on the opposite bank. Suspended at human height they are jostled by the breeze, wandering adults and romping children. 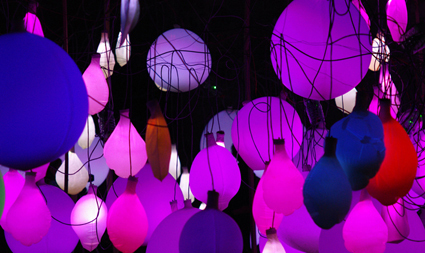 They glow unanimously and serenely with a soft blues, then pinks and later greens, each balloon lit from within. Later, to throbbing dance music and the cries of happy dancers, waves of more intense colours surge through the cloud-like mass and individual balloons flare on their own. True to its title, Celebra (Christian Clark, Fabrizio Devoto, Paul Grindel & Tomas Laurenzo, Uruguay), with its 200 LED-lit balloons, is a sensory delight, generating an instant party. On the pathway we encounter a trio of strange, figures – futuristic stilt walkers bathed in their own data-flow lighting and sound. Framed by stylish thin metal extensions of their arms and legs the performers are transformed into cyborgs. Not of the Exterminator variety, these serene Stalker Theatre creations (director David Clarkson, designer Alejandro Rolandi) simply are — there are no tricks, no personalities, no agenda that we can perceive. When will they turn on us? Or we on them — are they illegals? Or will we, in the due course of techno-evolution, become them? That is scary. Eric Siu’s very strange, helmeted Touchy adds a more amiable sense of the cyborg as he blindly offers his touch to passersby so they can enable him to record a moment of fleeting intimacy on film. In Grobak Padi (creative director Michael Hornblow), three traditional, pedal-driven Indonesian food carts and their cooks are not only the providers of, on this occasion, free nourishment but also, with monitors hanging from their frames, they are stations for the real time relay of performances between Jogjakarta and Sydney. A fourth, boat-shaped Grobak Padi arrives on a riverbank stage, accompanied by a synthesis of a pulsing hum and sweet high voices, smoke billowing from its small charcoal stove. A man in suit (Tony Yap), a potential customer, approaches the cart, leaves his coat and glasses on its roof and wanders away into a private dance. The vendor (Agung Gunawan) arrives in traditional dress and a long, flowing white scarf, moving elegantly about his cart, stepping onto the bicycle and balancing on one foot on the seat where he ‘pedals’ as if flying. The man spins, jumps and bounces, his movements staccato and increasingly robotic, the palm of one hand directed to his face as if obsessed. When the cook places a white female mask over his face, the two commence a strange, lyrical duet — the transformed cook astride the man, the man restraining the cook, covering the eyes of the mask. Eventually harmony is achieved — the couple exiting slowly through an intrigued audience of ISEA delegates, guests, families and young people — hungry for meaning and soon satisfied by satays and the other pleasures generously on offer from a cleverly curated and staged Electric Nights.